Providing the kind of customer service that turns a one time customers into a lifelong brand advocate. Scale your business with ease, or streamline your internal process with our expert workforce. We deliver the power of data that brings real insight into what your customers want and how they think. Seamless communication across every channel and in every interaction. The team at Customer Direct takes pride in being a boutique contact center that builds custom solutions for unique brands. We take the time to learn and understand your business to develop streamlined processes that increase consistency, accuracy and productivity while delivering an unparalleled customer experience. During the onboarding process, we sit down with your team to understand the nuances of your business and its unique needs. After the discovery phase, our expert customer service managers and workflow engineers use our proprietary workflow management software to develop and implement the most efficient and effective workflow strategy. Our technical engineers will work with your systems admins and/or IT staff to quickly integrate Customer Direct’s workflow tool and deploy the telecom strategy that’s right for your business. After specification of your unique reporting needs, Customer Direct will capture all call record statistics and key performance indicators, including quality and performance metrics and make them available via a web-based reporting platform. Customer Direct’s Human Resources department develops unique hiring profiles for each of its Clients. Our agents are carefully selected based on behavior, education, experience, skill and a desire to help others. Customer Direct offers a customizable quality assurance program to meet each client’s needs. Quality control standards and statistical process controls are put in place based on your requirements. After client onboarding and systems integration, we work with your team on an ongoing basis to continuously improve your brand’s customer experience. Depending on your company’s requirements, to discuss your reports, review your business needs, and calibrate our responses to ensure all of your customer experience needs are met. Review of Key Performance Indicators is a cornerstone of our regular meeting agenda. Service Levels, sales performance, resolution rates, efficiency, quality…these are the types of metrics that we build and monitor for your business. In our meetings, we talk about the experiences behind the numbers, what they mean for you, and what action plans we need in place to take those numbers where you want them. Staying on brand and delivering the quality customer service your clients have come to know and appreciate takes constant attention and upkeep. At Customer Direct we calibrate our agents responses on a weekly and monthly basis. Focusing on core KPIs established by you and your success manager, we pinpoint key customer interactions to review with you in order to find areas for improvement and recognize areas of success. Of all the customer interactions that are recorded, we focus on reviewing the ones that provide the most value and insight into your business. We keep a pulse on your business to make sure we are staying on message, delivering requested service levels, and staying up-to-date on all opportunities to improve your customer experiences. Beyond your standard business requirements, we are always analyzing customer experience information and looking to improve customer satisfaction, uncover new opportunities, and increase efficiency. From our call quality measurements and extensive sales training to our client-driven key performance indicators, our proprietary workflow management tools are built to deliver consistent, quality results. We developed an ongoing training platform designed to educate our agents on our systems and processes called Customer Direct University. In this program, Customer Direct works closely with our clients to create training curriculum to educate agents on the nuances and intricacies of the business and brand they are going to be supporting. From our extensive network of work-from-home agents to our seasonal/intermittent workforce solutions, we’ll make sure you have all the agents you need to deliver genuine, excellent customer service for every interaction. We know your daily schedule is full of responsibilities. This is why we offer both full-time and part-time positions. Early riser? Night owl? All schedules welcome. At Customer Direct, your schedule is built around your availability. By providing 24/7 support for our customers, we have opportunities every day of the week. With offices in St. Ann/Bridgeton, Arnold, and a successful work-at-home program, your commute couldn’t be easier. 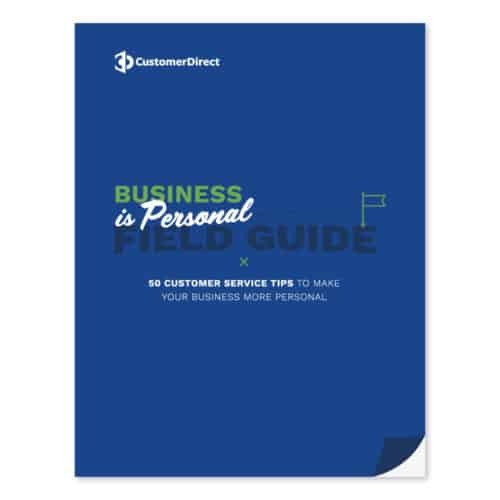 Check out our Business is Personal Field Guide, with 50 tips to improve your customer service experience.